The "buzz" stops here...the 1061 has arrived on NBwebexpress.com! Check out this excellent cushioning shoe that has been reviewed on Runner's World and is recommended for runners "with normal to high arches looking for plenty of cushioning and a firm base of support." In order to fully experience the benefits yourself, you really have to put the 1061's on your feet. The 1061 is flexible, comfortable and surprisingly lightweight for the cushioning it packs all together. 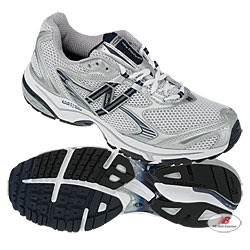 So, if you're looking for a little extra bounce in your step or cushion in your stride, try the 1061's. And if you are a 1060 wearer and are a little leary about trying something new, I doubt you'll be let down with the 1061's performance. the 1061's have been great - best part about the 1062s - they didnt mess them up - I like them just as much - and the red looks faster!